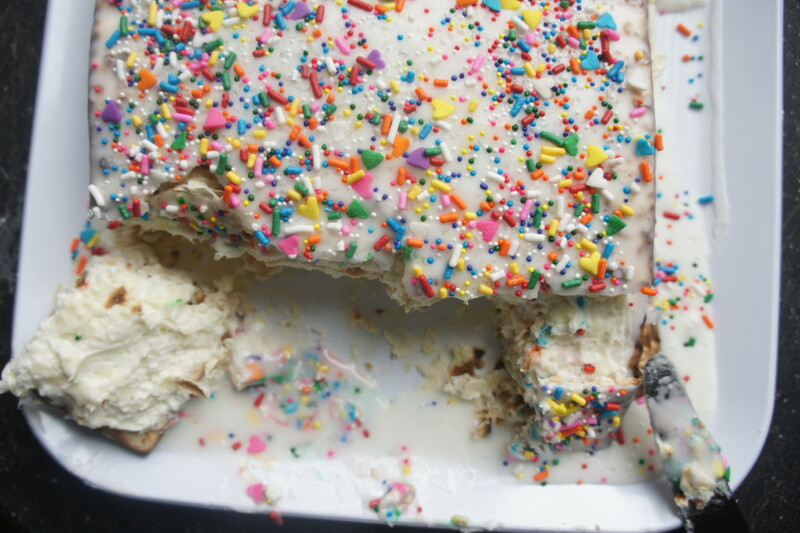 This recipe might just be proof that you could put frosting and sprinkles on anything and it would be delicious, including matzah. 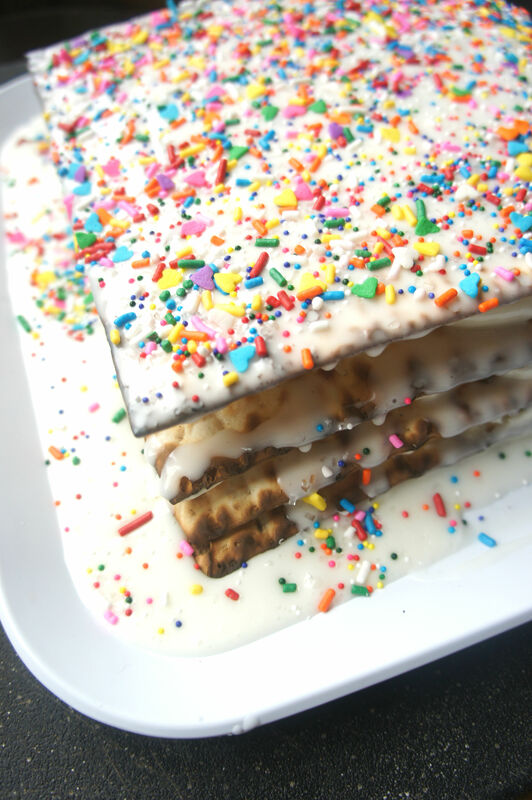 White chocolate, whipped cream cheese filling, and a healthy shower in frosting makes this matzah cake a fun, colorful, and pretty delicious dish to enjoy any time during Passover. 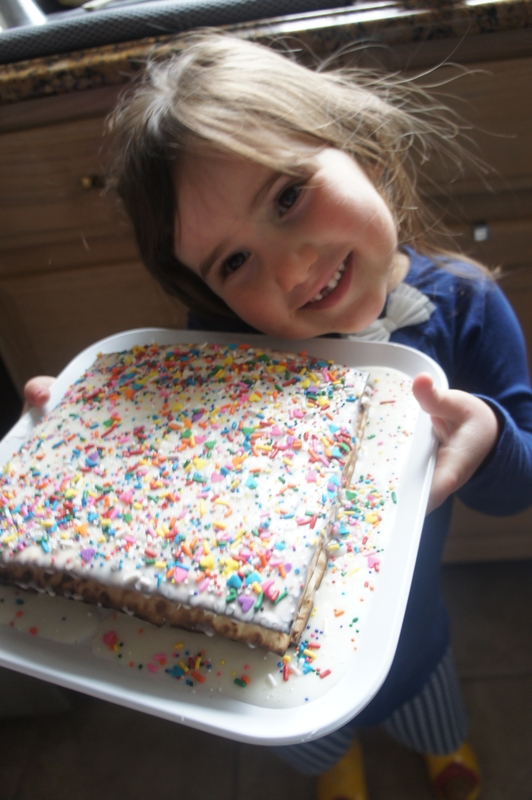 My daughter loved digging in, but so did my husband—truly a whimsical and indulgent dessert that can be enjoyed by all. This is very much a dairy dessert, and no, I don’t recommend trying to make it non-dairy. I do recommend assembling the cake with filling and allowing it to sit overnight before covering it in frosting. This will allow the matzah to soften slightly and the flavors to meld together. Place white chocolate in a glass bowl and heat in the microwave for 30 second intervals, stirring well in between, until smooth. Spread a few Tbsp on 3 pieces of matzah. Set aside. To make the filling, beat the cream cheese and sugar together using a hand mixer. Add vanilla and mix. Take chilled heavy cream and stream in to cream cheese mixture while beating on high. Beat until doubled in size but not too stiff. Pipe or spread the filling on first layer of white chocolate covered matzah. 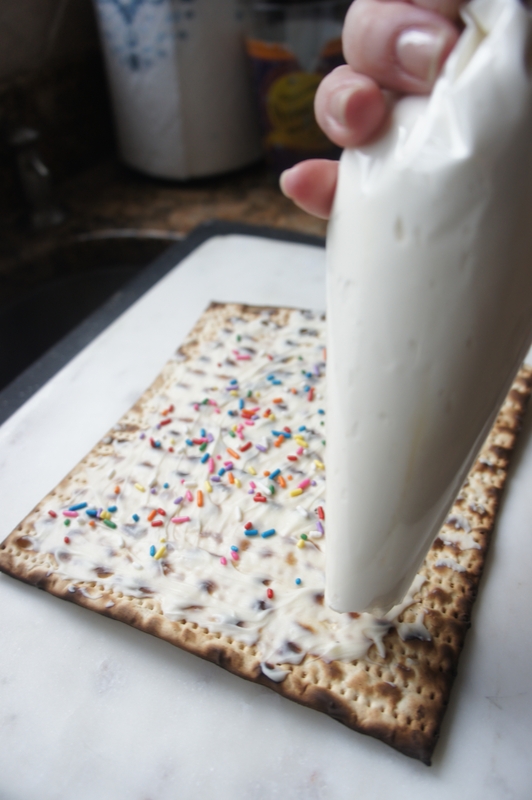 Top with second piece of white chocolate covered matzah and add more filling. Repeat a third time and then top with plain matzah. Remove matzah cake from fridge and flip over (you will notice that the matzah has started curl a bit overnight). To make the frosting, whisk together powdered sugar, lemon juice, and milk. If it looks too thick, add a touch more milk. Pour frosting over the top of cake. Allow to sit another 1-2 hours. The Passover seder is an adventure, not a chore — and Kveller’s new, family-friendly haggadah captures all the excitement, plus explains everything you need to know. Best of all? It’s free! Get it here.